When the open road reaches the sky. From its chrome diamond-block grille to its “twin torch” LED taillamps, the SLC wraps its long-hood/short-deck balance in brilliance. Designed to slice through the wind and through corners, its sleek muscle and wide stance reveal its pure sports-car soul. And its power hardtop is among the industry’s most elegant. 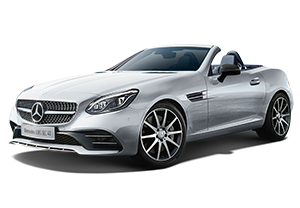 In around 20 seconds, the SLC’s signature power retractable hardtop folds into the trunk, delivering open-air euphoria while leaving ample luggage space. An electric trunk divider makes top-lowering even easier. Two types of Panoramic roof are available: with a tinted see-through panel, or the electrically variable tint of exclusive MAGIC SKY CONTROL. Offer end May 31st, 2018.